If you plan to visit China, you will surely be surrounded by some colorful and amazing Chinese symbols, such as the national flag, emblem, and anthem. They all have a story behind them, and through them you will be able to understand better Chinese people&apos;s values and culture. We suggest you get familiar with 11 or so of the most important Chinese symbols. The National Flag of China is bright red with five golden stars adorning it on the upper left corner. The star on the left is larger than the other four, and it represents the Communist Party of China. The other four represent millions of Chinese people. The red represents the communist revolution led by the Communist Party of China. 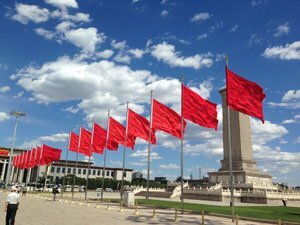 The whole flag symbolizes Chinese people overcoming all difficulties, defeating all enemies and invaders, and succeeding in all revolutions and construction projects, under the leadership of the Communist Party of China. On October the 1st, 1949, the present Chinese flag was first hoisted in Tian&apos;anmen Square on the occasion of the foundation of the People&apos;s Republic of China. The designer of the national flag was Zeng Liansong (1917-1999). He was an economist in Shanghai, and a member of the standing committee of the CPPCC Shanghai committee. When he was younger, he joined the Liberation War against Japan. The five stars on the emblem have the same meaning as those on the national flag. The golden gear represents the workers. The wheat represents the peasants. The connection of them represents the Worker-Peasant Alliance led by the Working Class of China. The colors of the National Badge are red and gold. The two colors reflect the people&apos;s wish of being fortunate. 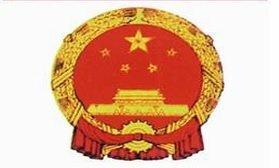 The whole badge symbolizes the New Democratic Revolution beginning with the May Fourth movement and foundation of the People&apos;s Republic of China, with the constitution of the People&apos;s Democratic Dictatorship, on the base of Worker-Peasant Alliance, and under the leadership of Working Class. The Chinese National Badge was designed by Liang Sicheng, Lin Huiyin, and six other experts, and finally confirmed by Gao Zhuang. Follow the notes to sing the Chinese anthem. The National Anthem of the People&apos;s Republic of China is the March of the Volunteers. 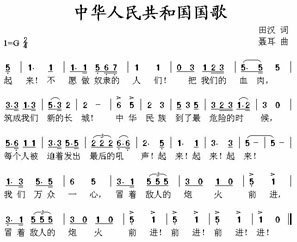 This song was composed by Nie Er and Tian Han in 1932 and adopted as a theme song in the movie Children of Trouble Times in 1935. Both the song and the movie aimed at encouraging Chinese people to resist the invasion from the Japanese, and millions of Chinese youngsters were raised by this song and dedicated themselves to the liberation of their motherland. On September 27th, 1949, March of the Volunteers was adopted as the temporary national anthem. After a ban on singing March of the Volunteers during the Cultural Revolution, in 1978 it was readopted as the national anthem. Bǎ wǒmen de xuèròu zhùchéng wǒmen xīnde chángchéng! Zhōnghuá mínzú dàole zùi wēixiǎnde shíhòu, měigerén bèi pòzhe fāchū zùihòude hǒushēng. Wǒmen wànzhòng yīxīn, màozhe dírén de pàohuǒ. Qiánjìn! Màozhe dírén de pàohuǒ. Qiánjìn! Qiánjìn! Qiánjìn! Jìn! Arise! People who don&apos;t want to be slaves! With our very flesh and blood, let us build our new Great Wall. When the people of China are in the most dangerous time, everyone will be forced to shout a last shout. We&apos;re millions with one mind. Let&apos;s brave the enemy&apos;s gunfire. March on! Brave the enemy&apos;s gunfire. March on! March on! March, March on! Mao Zedong&apos;s image is respected and prolific. In 1949 Mao Zedong founded the People&apos;s Republic of China. Mao was the Chairman of the Communist Party and a controversial Chinese leader until his death in 1978. In 1972 he met with President Richard Nixon in an effort to show acceptance to the West. This meeting signified a movement closer to the US and away from the Soviet Union&apos;s influence. Mao is regarded as a symbol of unity in China and he is considered responsible for making China a significant power in the 20th century. 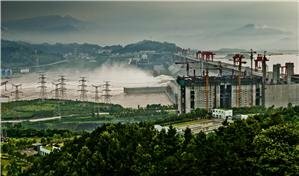 However, this cost China millions of lives. 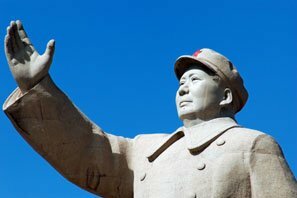 Mao cultivated a "cult of personality" and his image is everywhere in China. The giant pandas are known for being China&apos;s most adored animal. 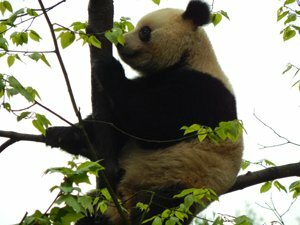 These animals have special reservations, and China recently removed the giant panda from the endangered animals list. If you want a dose of cuteness, there are many zoos that can offer a large variety of pandas: cubs, young and old or even red pandas! Another symbol of China when it comes to animals is the dragon. These are mythical creatures that appear in most Chinese legends, and you can notice that the Asian architecture is decorated with this symbol of power. Chinese people often refer to themselves as "Descendents of the Dragon" to talk about their ethnic origin. There are many types of dragons and their powers were over water, typhoons, and rain (many of the elements that used to affect in a devastating way the Chinese people). 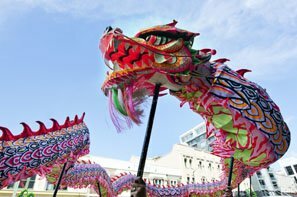 Chinese dragons can be often seen during festivals, especially the Dragon Boat Festival, where dragon decorated boats race. 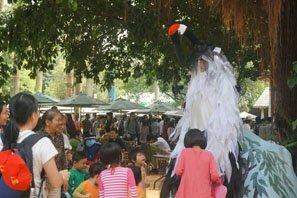 Dragons cannot be missed during the Chinese New Year, where dragons puppets are manipulated to dance. The dragons are said to have the power to keep off evil spirits. The Red Crowned Crane is China&apos;s national bird, and it is a symbol of elegance and flight. In some of the Chinese legends, they are seen as being helpful and wise. They are often associated with the idea of immortality and the journey of life. You must have tasted at least once in your life the juicy kiwi fruit. Well, this is one of China&apos; national fruits. It is very common and you can find them in supermarkets. Another fruit that represents China is the jujube. This one looks like a date and inside it has a stone, similar to olives. Indulge yourself in these healthy treats! We guarantee you will like them! The national flower is the peony, according to a study conducted in 1994 where people all over China had to vote their favorite flower to represent their country. The Ginkgo is China&apos;s symbol of hope and peace. The Chinese monks introduced these trees to Japan. A few of them survived the bombing of Hiroshima. Because of this, they have also become a symbol of endurance and vitality. One of the surviving trees has prayers of peace engraved on its bark. The leafs have unique proprieties, and they are used in teas and memory improving medicine and vitamins. 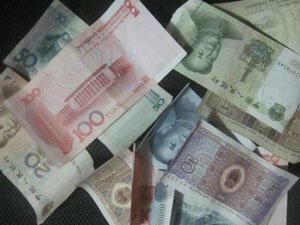 The official currency in China is the Renminbi. The ISO Code for Renminbi is CHY.Yuan is the basic unit of the currency. One yuan can be divided into 10 jiao, and in turn, can be divided into 10 fen The currency is issued by the People&apos;s Bank of China, the monetary authority of China.You can use the renminbi anywhere in mainland China, even in Hong Kong or Macau, although there it would be easier for you to pay using other currency. 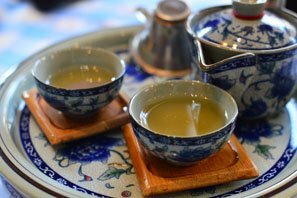 When you&apos;re thinking about China you can also have in mind different objects, places and activities. This is why we have compiled a list of some less formal symbols of China. 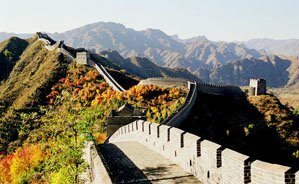 The Great Wall is a symbol of China&apos;s unity in construction and national defense. The Great Wall of China is an impressive structure, the largest man-made in the world and was built between the 5th and the 17th century BC to protect the Chinese Empire. Porcelain (china) is an unofficial symbol of China, named keeping in mind its origin. This delicate but resistant material was used to create exquisite items, adorned with flowery patterns. 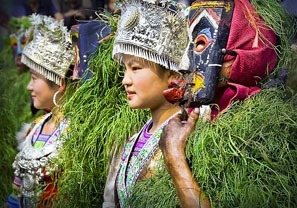 Chinese national costume or is different according to the ethnicity and era of history. The men traditionally wore hanfu (loose-fitting tunics and skirts) and women more recently qipao. Mao suits were the national dress of the Communist era. Kung fu is the fighting style developed by the Chinese and incorporates their use of intellect over brute strength. It was made popular in the Western world by the kung fu movie star Bruce Lee. His movies created a kung fu frenzy all across the world! The national sport is table tennis also known as Ping Pang Qiu. The national colors are red and yellow, of course, red symbolizing power and the Communist Revolution and yellow, wealth. Read more on lucky colors in China. The Chinese also have their own special type of writing and even their own horoscope. 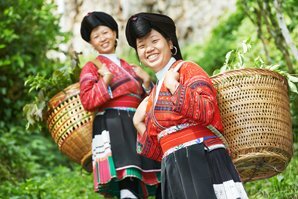 We encourage you to explore all the aspects of Chinese culture and join us for an exotic adventure! Tian&apos;anmen Square is full of symbols of China. The Chinese Zodiac — Find Your Sign! 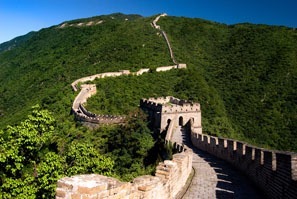 The 7 Wonders of China — Truly Breathtaking!